On March 31st Competition and Markets Authority (CMA) completed its first year. In those 12 months the new agency took 84 Phase 1 and 3 Phase 2 merger decisions. This article summarises some of the main points of interest. These focus on the pattern of decisions and the analysis underlying them (as opposed to how the changes to the merger control process have worked – which merits an article in its own right). 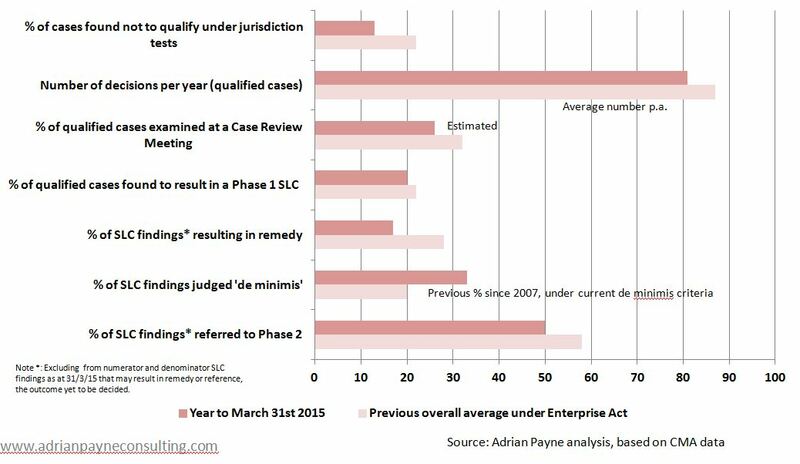 As the graph below shows, Phase 1 case numbers were nearly back up to the annual average under the Enterprise Act, the highest number of cases since 2007/08. This was despite a sharp reduction in the number of non-notified mergers that the CMA ‘called in’ for investigation – one reason why the proportion of cases found not to meet the qualifying tests for jurisdiction was well below average (as also shown in the graph). Is the CMA being more selective than its predecessor, particularly when it comes to smaller transactions (see also point 4)? Or were there simply fewer problematic non-notified deals among the 600-or-so transactions screened by the agency’s Mergers Intelligence team during the year? There were only three Phase 2 decisions made during the year, the second lowest number in any year under the Enterprise Act and well below the average. This reflects in part the dearth of references to Phase 2 in the CMA’s first six months – described in my earlier article – together with only two references being made in the OFT’s final six months. Around 80% of Phase 1 cases were cleared. Nearly 20% were found to give a reasonable prospect of in a substantial lessening of competition. This proportion is very much in line with the average level under the CMA’s predecessor Phase 1 body, the Office of Fair Trading. As can be seen from the graph there is little sign so far that the CMA’s new arrangements for remedying competition problems at Phase 1 have resulted in significantly more remedies being proposed and accepted, the main objective of the change. Of this year’s three Phase 2 decisions, one (Breedon Aggregates/Aggregate Industries) involved a divestment remedy and a price cap remedy where divestment was not possible. By contrast more SLC decisions than usual were deemed too small (so called ‘de minimis’ cases) to justify the costs of a Phase 2 enquiry, including one (WGSN/Stylesight) involving a market of over £6m – the largest so far since the de minimis policy was introduced. In addition to these, four cases were cleared on de minimis grounds without a final decision being taken on their competition merits (Eden/Riders, Vitec/Autocue, Phonak Comfort/Audio and Key Publishing/Kelsey). This is not entirely new but has not happened on this scale before. Is it an approach that will be expanded further? De minimis arguments were rejected in only two cases: Reckitt/K-Y and InterCity Railways/Intercity East Coast Rail Franchise. In the former, the CMA worried about the fact that similar deals might happen (so-called ‘replicability’) – a contrast to the ‘wait and see’ approach in some other cases. Overall, the CMA seems to be taking a more expansive approach to de minimis policy. As the new agency has to demonstrate benefits to consumers that are at least ten times its costs (previously it was five times costs) it would not be surprising if the balance of its case portfolio (within mergers and beyond) was to shift. Horizontal ‘theories of harm’ remained the overwhelming focus for the CMA’s analysis as usual. However 23 cases also involved so-called ‘vertical theories’. Once again coordinated effects were out of fashion, featuring in only one Phase 1 case (Ballyclare/LHD). Exit closed. Please try an alternative route. As usual, exiting asset/failing firm arguments cut little ice with the CMA at Phase 1 – rejected in all 11 cases in which they were put forward (one of the most interesting being Roanza/Enza). At Phase 2, however, these arguments played a key part in the clearance of the Alliance Medical/IBA deal , despite representations by one of the party’s competitors that they would have bought or supported the target business in the absence of the merger. ‘Upward price pressure’ measures combining ‘diversion’ and financial margin data turned up in only one Phase 1 case (Asda/Coop) this year. This somewhat understates the importance of the price pressure approach, however, as measures of diversion carried weight in numerous cases (see number 12 below) and financial margins continued to be examined, even though (somewhat puzzlingly) that analysis is not always evident in the CMA’s published decisions. While entry arguments were often made by parties and (as usual) were mostly rejected or superfluous, there were nevertheless three Phase 1 examples where the CMA gave weight to timely, likely and sufficient entry by rivals (Ballyclare/LHD, Care Monitoring and Management/Pantzel and Coopervision/Sauflon Pharmaceuticals). In addition the potential for innovation to enhance competition was given a lot of weight in Cirrus Logic/Wolfson. Rival entry was also said to meet the ‘timely, likely and sufficient’ criteria in the Phase 2 Omnicell/Surgichem clearance decision. Countervailing buyer power arguments appear to have played a part in just one Phase 1 case (Herstal/Manroy), though the summary of the decision gives more weight to this than the main text of the decision. Third party views, internal documents and bidding/tendering data (in that order) were particularly important sources of evidence, with problematic internal documents cited especially frequently in the Phase 1 SLC decisions (a notable example being Pure Gym/The Gym). However…as every year, seemingly hottish documents do not always mean SLC – witness the Multipackaging Solutions/Presentation products case. On evidence more generally it is worth noting that the CMA used its new information-gathering powers on 23 occasions at Phase 1, applied to third parties as well as to merging parties themselves. Interestingly the Phase 1 SLC decisions strongly tended to feature complaints from both customers and competitors (as compared to the clearance decisions). Once more the simple and often-heard ‘conventional wisdom’ that competitor complaints tend to encourage agencies to clear mergers turns out to be pretty wide of the mark. One quarter of all Phase 1 cases involved the use of data on the bids and tenders that the parties had been involved in, primarily to examine the degree of diversion of business between the parties and others. Particularly interesting cases include: Sonoco/Weidenhammer, Ballyclare/LHD, Multipackaging Solutions/Presentation Products, and Xchanging/Agencyport. One – bidding analysis is not as straightforward as it may seem. Two – the results (and the reading of past cases involving this type of analysis) need careful interpretation. In summary, while case numbers recovered, there were few if any that offered great potential for a major policy change. Forthcoming decisions look much more interesting in that regard! whether the CMA is becoming more selective about the non-notified deals it calls in for investigation. As usual, however, there have been many interesting lessons for parties about to merge in terms of how to assess their merger and the approach the CMA will adopt. Links to cases referred to above can be found on the CMA’s web pages . This entry was posted in Merger analysis, Merger strategy and tagged analysis, best practice, CMA, competition and markets authority, customer concerns, de minimis, economics, entry analysis, evidence, gym, internal documents, lessons, M&A, merger, merger economics by Adrian Payne Consulting. Bookmark the permalink.